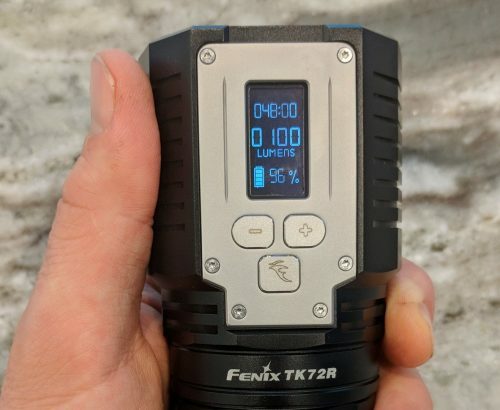 The Fenix TK72R is the most powerful flashlight I've ever tested, and it gives off way more light than anyone could ever need. Before I get into the specifics of this flashlight, however, I must share the manufacturer's warning with you, because it's the best. 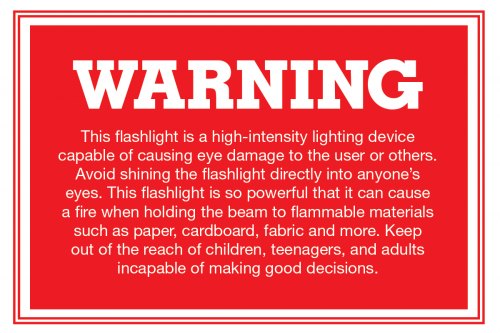 I'm not going to lie, I was sold on this flashlight after reading the warning. 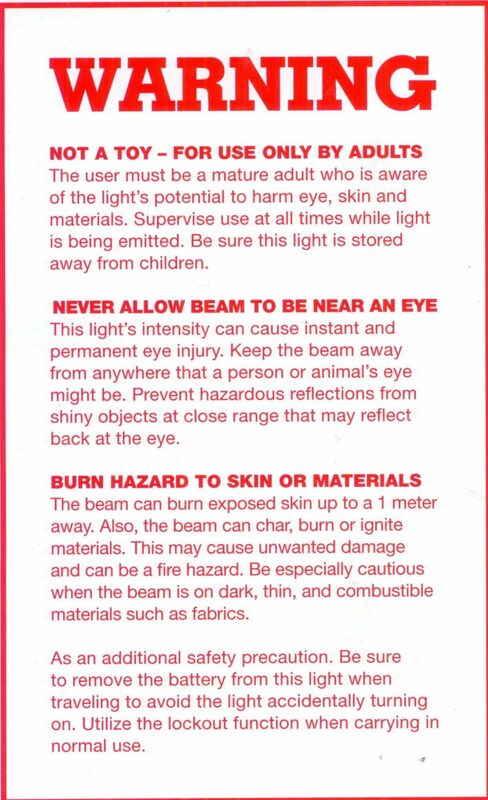 Not only that, but the warning sheet that comes with the flashlight is even more specific and... awesomer? Of course, I only had one question after reading the warning: will it really start paper on fire? That's the first thing I tried. No luck. I'm sure it would work under the right conditions, but I didn't try too hard. 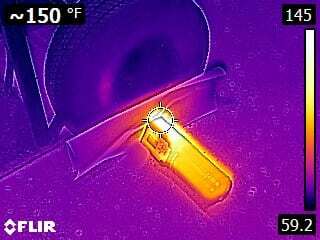 I simply held the flashlight against a piece of paper until the flashlight was too hot to hold. 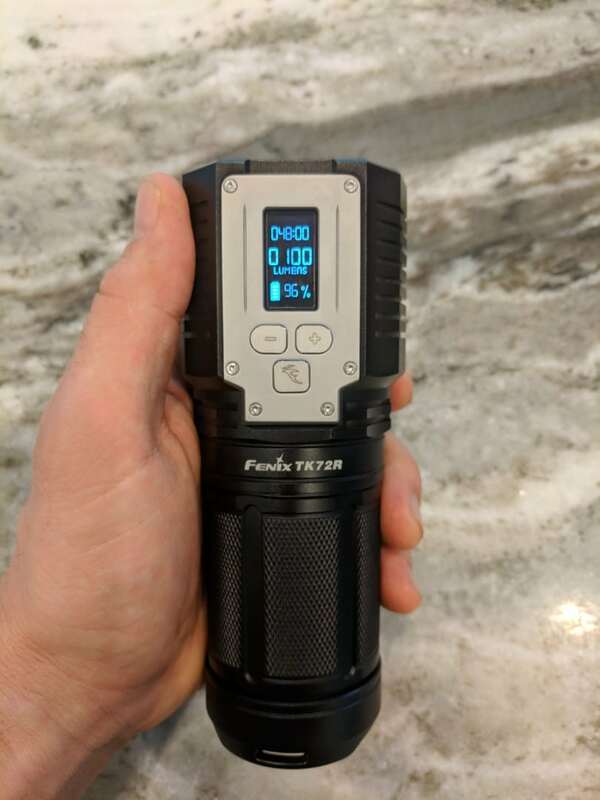 What's surprising about this flashlight is how fast it gets hot; at the full 9000-lumen brightness, you can feel the head getting hot quite quickly. Uncomfortably hot. It won't stay at full brightness for very long, however. The graph below shows how the brightness drops off fairly quickly, leveling off at 2500 lumens after only a few minutes. This flashlight is a tank. I think the "TK" in the model number probably has something to do with "tactical", but in this case, I'll assume it means tank. This definitely isn't the type of flashlight that you slip into your pocket. It's too big and too heavy. The good news is that it comes with a nice heavy-duty carrying case, and it slips in and out of the case quite easily. The case also has a velcro strap to keep the flashlight from falling out. Good stuff. I had to read over the control instructions a couple of times to get it. There are tons of settings, and you can read about them if you want to, but it's not necessary. I gave the flashlight to my 7-year-old daughter and told her to make it bright. She figured it out in about 3 seconds. The short version is that you can hold down the plus and minus buttons to increase or decrease the brightness in 1,000-lumen increments or quickly touch them for 100-lumen increments. 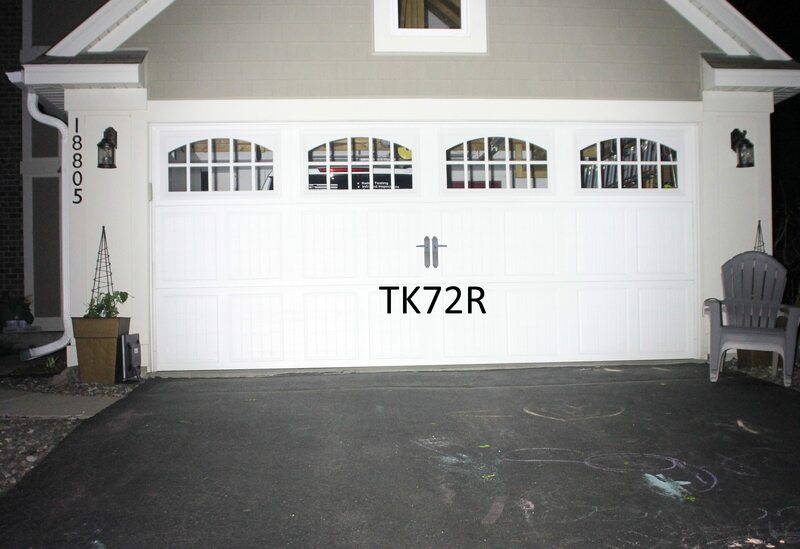 The TK72R comes with a gigantic 7,000 mAh rechargeable lithium-ion battery. The digital display shows the percentage of battery charge left, the brightness setting, and how much longer the flashlight will run at the current light setting. It's perfect. No more guessing how much battery time is left. In the image below, you can see that the flashlight is at 96% battery life, 100 lumens, and will run for 48 hours straight at this setting. 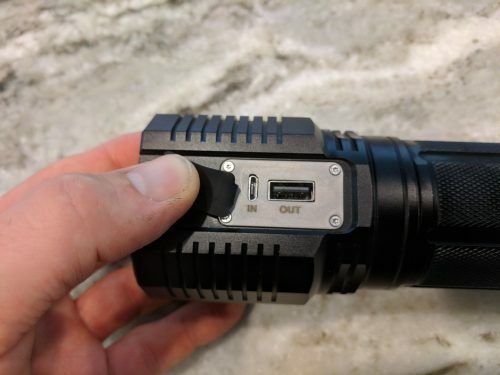 This flashlight has a built-in micro-USB charging port, as well as a full-sized USB port that can be used to charge other devices. Cool stuff. It's a power bank. 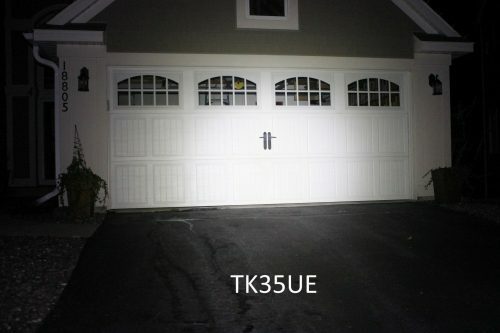 I've taken some photos of the front of my garage with various other flashlights, so I'm keeping with that theme. For comparison, here's the old Fenix TK35 that I was really excited about many years ago. 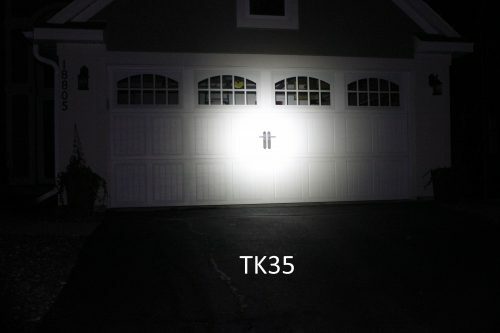 Here's a newer TK35UE at the full 3,200-lumen setting. Impressive, right? 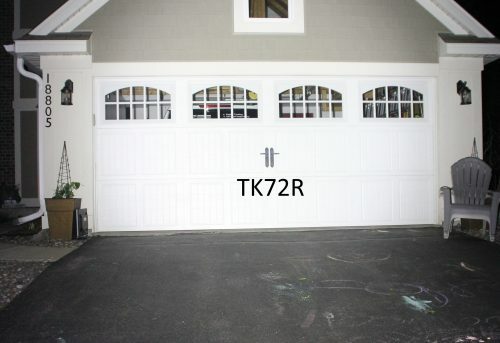 Not compared to the TK72R at the 9,000-lumen setting. The image says it all. Does anybody need this flashlight? Heck no. This is more flashlight than anyone needs, but sometimes you just want to treat yourself. Also, Father's Day is coming up very soon. If you have a father who would love a crazy-powerful flashlight that might double as a fire-starter, look no further. This is it. The TK72R currently retails for $329.95 at https://www.fenix-store.com/fenix-tk72r-rechargeable-led-flashlight-9000-lumens-1/. 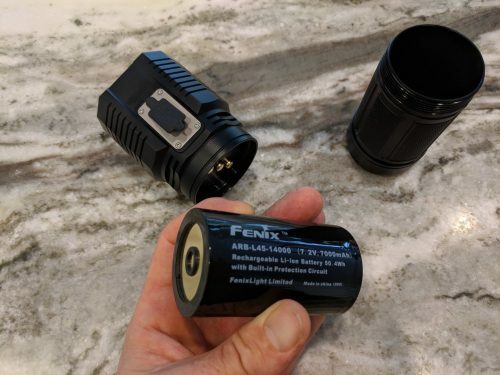 If you're looking for a flashlight under $100, I also posted a short review of the Fenix UC35v2.0 last week.